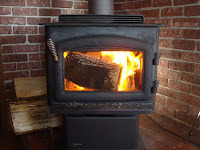 It was -15°C this morning, so we decided that we'd light the stove in the kitchen as well as the one in the living room. It's much bigger, so kicks out an impressive amount of heat. Both our smoke alarms went off as the dust on the top of the stove burnt off (can't think how it got there) - so at least we know they're working. 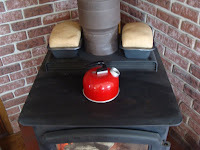 It's possible to boil a kettle on the stove-top (if you're not in a huge hurry for a cuppa, that is), so there's the added benefit of having another cooking surface while we've got it alight. The only drawback is that with two fires going, you feel as though you're a bit of a slave to refuelling them. Postscript: It turns out to be the perfect place to prove bread dough, too! Might have to go mad and buy a proper kettle though. This one was bought for a camping trip in 1990 and is a bit on the small side.